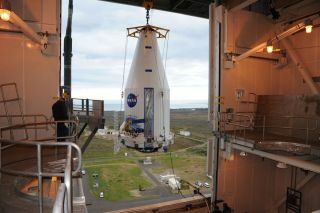 The payload faring containing the Landsat Data Continuity Mission LDCM spacecraft is lifted to the top of Space Launch Complex-3E at Vandenberg Air Force Base where it will be hoisted atop a United Launch Alliance Atlas V for launch. Image released Jan. 25, 2013. NASA's latest Earth-observation satellite is set to blast off today (Feb. 11), continuing a venerable program that has been monitoring environmental change and resource use for more than four decades. The Landsat Data Continuity Mission is scheduled to launch today at 1:02 p.m. EST (1802 GMT/10:02 a.m. PST) atop an Atlas 5 rocket from Vandenberg Air Force Base in California. The LDCM spacecraft will track changes in forest cover, agricultural output and urban sprawl, among other things, adding to a Earth-observation record that has been growing continuously since Landsat 1 lifted off in July 1972. "LDCM will be the best Landsat spacecraft yet, in terms of improved capabilities and the amount of data returned," mission program executive David Jarrett, of NASA headquarters in Washington, D.C., told reporters Friday (Feb. 8) in a prelaunch press briefing. "LDCM will continue the Landsat legacy well into the future." You can watch the Landsat launch live on SPACE.com here beginning at 10:15 a.m. EST (1515 GMT). An artist's view of the Landsat Data Continuity Mission spacecraft in orbit above the Gulf Coast of the U.S. The SUV-size Landsat 8 will zip around Earth at an altitude of 438 miles (705 kilometers), staring down from a polar orbit with two sensitive instruments. The Operational Land Imager (OLI) will collect data in visible, near infrared and shortwave infrared wavelengths, while the Thermal Infrared Sensor (TIRS) will measure surface temperatures. By tracking forest destruction, water use, urban expansion, glacial retreat and other fast-accelerating phenomena, Landsat 8 will help scientists and policymakers better understand how Earth's seven billion people are affecting the planet, researchers said. "All of these changes are currently occurring at rates unprecedented in human history, due to an increasing population, advancing technology and climate change," said mission project scientist Jim Irons, of NASA's Goddard Space Flight Center in Greenbelt, Md. "We will be able to monitor these changes — to continue to observe these changes — from LDCM, from the best Landsat satellite ever launched." Landsat 7 has enough fuel to stay in an operational orbit through 2016, Irons said. The Landsat 8 spacecraft and the OLI instrument have design lives of five years, and the TIRS sensor was built to last at least three years, he added. The satellite has enough fuel to stay in its desired orbit for at least a decade. "We hope that the spacecraft and the instruments will last well beyond their design lives, and we can continue to collect data for at least 10 years," Irons said.